The general physical traits of the people of Andhra Pradesh are tall, round-headed, broad-faced, with a long arched forehead, thick and protruding noses, with straight hair and yellow skin. Certain castes of Brahmins and Kapus of Vizag district, in Andhra Pradesh have the following features which accords with the description of the sub-races of the Mediterranean belonging to the main division of Caucasoid; short of medium height, with long and elevated or medium-sized heads, normal eyebrows, with short broad faces, prominent but medium-sized noses, straight hair and wavy tufts. The general colour of the skin is wheat-gray. The other inhabitants of the Andhra are divided into two classes. The first of them belong to the forests and hill area of the Deccan Plateau. The others belong to the extended areas of the doab between the rivers Krishna and the Godavari. The foresters answer to the description of the Australoid sub-race. The Chenchus of Srisailam hills belong to this class. They are short, with elevated long heads and possess clear and well-defined eyebrows, with protruding mouths and snub flat noses. The general colour of the skin is wheat-gray and the hair is black and crinkled. Gadabas, Savaras and Koyas belonging to the Bhadrachalam and Simhachalam hilly areas, bear the complex features of Mongolids and Australoids. From the earliest times, the Telugu land included among its inhabitants foresters and hill-men and other tribals. Some tribals inhabited the sea-board region. Today there are nearly 32 lakh tribals and 50 lakh nomads and other backward people in Andhra Pradesh. Their habitat spreads along the coastal and mountain strip of the Bay of Bengal from the Bhadragiri agency in Srikakulam district to the Bhadrachalam agency in Khammam and Godavari districts. From there it spreads north-east wards to the Adilabad region. This tribal area is contiguous to the tribal areas of Bastar, Dandakaranya and Vidarbha. 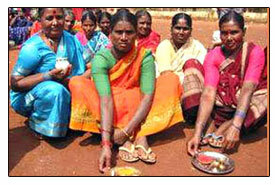 There are about thirty-three kinds of tribals in eight districts of Andhra Pradesh. Important among them are the Khonds, Kolamis, Nayakpods, Koyas, Kondadoras, Valmikis, Bhagatas, Savaras, Jatayus, Gadabas, Yanadis and Chenchus. These tribes have absorbed elements of Hinduism. The tribal people worship their own pantheon of nature gods and goddesses and continue to revel in their ancient customs and manners. Their languages do not have scripts and are essentially verbal. Tradition has a firm grip on them. The laws of tradition are always obeyed scrupulously and any breach is strictly censured. Their social life is obedience to the leader who commands immense respect and holds sway over all aspects of tribal life. They do not hesitate to participate in the feasts and festivals of the community. They sing and dance. The Yanadis along the coastline, the Chenchus of the Srisailam hill area, the Koyas and Savaras of Godavari and Srikakulam forest areas, and the Khonds of Adilabad forests are typical in ancient habits. Their beliefs are simple and seek direct uninvolved expression. They are honest and frailties in character. In Andhra Pradesh there are certain nomadic tribes. Piccukaguntlu, Balasanta, Saradakandru, Viramushtivaru, Bavanilu, Birannalavaru, Gollasuddulu, Davaluru, Jangamulu, Kommuvaru etc are Telugu nomads whose main occupation is ballad singing. They are favoured by particular castes for maintaining their family records and singing their past glory. Some of them are occupied in itinerary trade and commerce, while their womenfolk are engaged in cottage industries like making toys, baskets, mats, beads and cosmetics. They are always on the move, subject to the changes of weather and this state of living is traditional. These nomadic tribes have their own forms of recreation and pastimes which go a long way in making their life less rigorous and even contended. They take suffering in their stride but they know how to seek refuge from life's worries in a native and pleasant manner. Among non-Telugu nomads, Lambadis also called Sugalis are very prominent. Originally they were Rajasthani's who took to a nomadic way of life and moved in batches towards the south of the sub-continent. Some of them are found in rural areas. They are itinerant traders. Besides the Lambadis, mercenary soldiers of Maharashtrian stock have settled down mostly in Telangana. They are called 'Are' and they speak a dialect which is a mixture of Marathi and Telugu. Their occupation is agriculture. They have only a spoken language. Their manners and customs are different from those of the country of their domicile. Cultural complexities have arisen due to historical circumstances. Many foreigners of different faiths have entered Andhra Pradesh and some of them made cultural conquests through fire and sword. Others prevailed in the guise of spiritual uplift. Both these foreign elements have disrupted the continuity and peaceful life of the people and affected their tradition and culture. The Tribal Welfare and Social Welfare departments are trying to better the lot of the tribals and backward classes with educational and economic plans. Free education, hostel facilities, cottage industries, housing societies, agricultural facilities, bank loans and cooperative corporations for the marketing of forest produce like honey and herbs, are some of the ways by which it has sought to better the lives of these simple people.